November and December were revised down a net 24k. The Not in Labor Force total and, consequently, the Participation Rate are ridiculously stubborn, having added 153k and remaining at 62.7% respectively. Weekly pay for the Private Sector, Construction, and Manufacturing all receded, and the workweek got shorter in total and for Manufacturing and Construction. That all seems reasonably confirmatory of the Productivity and Costs report released Thursday that showed productivity down but unit labor costs up in Q4 2017, as hourly pay did increase. Sounds pretty bad, right? Not so fast! The headline boasts 200k net new hires which easily beats the consensus averages and of those a whopping 196k were added in the Private Sector. 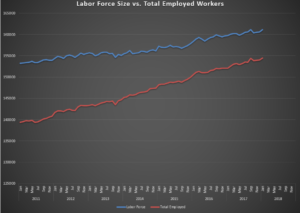 The Labor Force grew by 500k, and the Total Employed was up 400k. That’s today’s graph and we can see the lines are moving the right direction and showing some convergence. That’s good. Other anecdotal data points out there suggest some of the stinky stuff above will experience some positive revisions over the next 3 months, and we will begin to see the impact of the tax reform trickling in next month. All in all, we are in good keeping with last month’s report describing 2017 as “mixed.” It still is. But keep in mind what an improvement that is from where we’ve been in the not-too-distant past. To answer the three most frequent questions we field of late, ride the stock market wave, but DO NOT pull down the safety nets. Stop orders, inverse ETFs, index Put options, alone or in combination, are all good hedge vehicles depending on the structure of the portfolio. Give us a call if you’d like more detailed thoughts. In small and mid-size firms, be leaning in the direction of growth vs. cash stockpiling for rainy days, but make sure you move on quantifiable demand as opposed to getting out over the skis on speculation alone. Bitcoin? No. That’s it for this month. See you at the month’s end for the next Blue World Economic Index® report, which posted a record high for January and got off to a great start for February, and the next Jobs Report is scheduled for…wait for it…Friday, March 9th. Doesn’t that sound wonderful?! ?